Are you looking for a way to improve your health and shred body fat with a keto diet? Or maybe, you are ready to take a challenge and get yourself into the best shape of your life? All this is possible now because we launched the ACCELERATED WEIGHT LOSS & HEALING KETO MEAL PLAN. HOW OUR KETO PROGRAM WORKS? 1) You will get a four weeks keto meal plan that is designed for accelerated weight loss and vibrant health. You will get the best results if the meal plan is followed as it is laid out. 2) The Ultimate Start-Up Guide will teach you everything you need to know about a keto diet and how to use it as a weapon for optimal health and fat loss. 3) You won’t have to worry about macros anymore because all macros calculated for accelerated fat loss. 4) The recipe guide contains 40+ delicious and fast to make keto meals including keto desserts. Most of the recipes are single servings so you won’t have any wasted food and you will save money. 5) All the recipes are dairy-free and nut-free. This will speed up your weight loss process and may help to reverse type 2 diabetes. 6) You will get access to our private Facebook group for support, motivation, and amazing keto community where you can ask questions and share your journey. Here is what makes my plan so special. Most meal plans out there let you do it on your own, but I will guide your steps to success. 7) The weekly shopping lists contain the foods you need to buy for all the meals to get you started for week one. Most of the products are common and you may already have them in your house. The other ones, like coconut oil, can last you for the entire four weeks once bought. 8) The printable meal planner organizer to track your progress is a bonus from me to you that will help you stay focused and follow the meal plan successfully. Remember that eating fat does not make you fat. We blame on fat for what carbs do. Being in ketosis and becoming fat-adapted comes with so many health benefits that you will love. 2. You will notice an improvement in your energy levels and sleeping patterns. Other benefits are clearer thinking, lack of hunger and feeling more energized during the day. We apply the science behind a Ketogenic diet to deliver you the best results. 3. You get motivation and support to achieve all your goals. Yeah, baby! So to celebrate the release of my keto meal plan I am doing a giveaway! 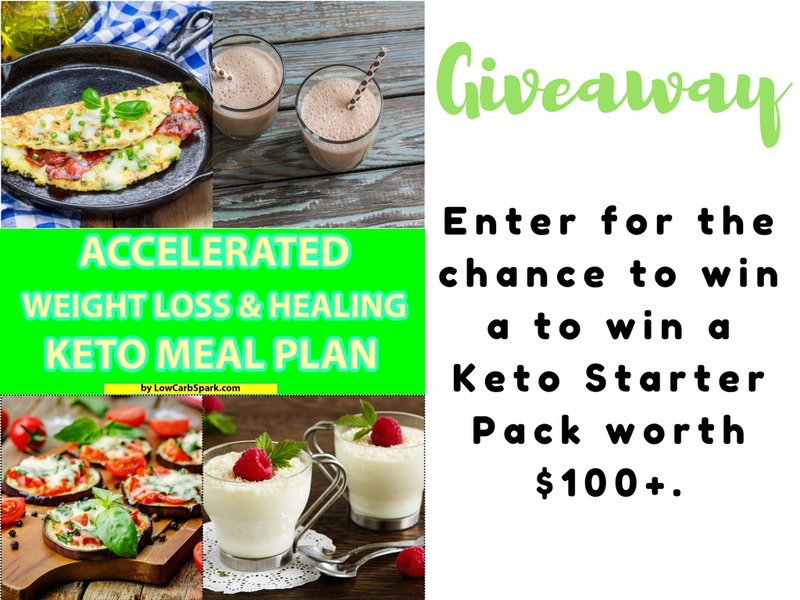 One lucky person is going to win a Keto Starter Pack worth $100+. The rules are simple. The only thing you have to do it to get your copy of my meal plan (click here) and you are automatically signed to my giveaway. Hurry up, only the first 100 people who get the meal plan enter the giveaway. I will extract the winner using random.org, live on my Instagram account (Follow me here). I hope you are as excited as I am for this giveaway. I also can’t wait to start working with all of you! What do you think about the prize?